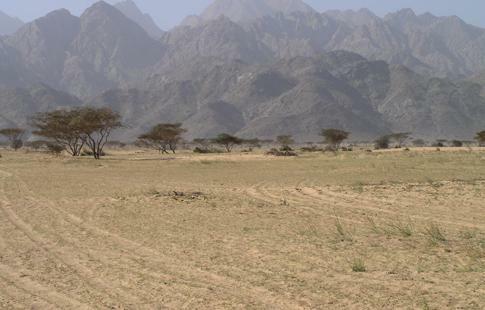 Gebel National Park showing both its coastal desert lands and its high mountains ranges. Established in 1985, Gebel Elba National Park spans a total of 35,600 square kilometers and overlooks the Red Sea. This vast region includes mountain ranges that reach peaks of up to 1,435 meters and a coastal desert area that stretches 25 kilometers along the coast. Unfortunately, although the Gebel Elba National Park has a lot to offer, it is often left unvisited by many. This is due to it being a disputed area between Egypt and Sudan. Even though the national park is currently under Egyptian government control and considered a protected area under its government, it remains heavily disputed over. Those who do want to visit are advised to first obtain permission from the Egyptian government and are often times accompanied by police officers during their visit. Gebel Elba National Park is located north of Sudan, in the remote southeast region of Egypt. This region, situated on the Halaib Triangle, experiences annual temperatures ranging from a high of 121.9 ºF and a low of 62.9 ºF. The national park is located in a continental temperature regime, which contributes to its constant and extremely high temperatures. The annual average temperature in Gebel Elba is about 88.9 ºF. Although it strictly dependents on what region of the national park is being discussed, mountain ranges or the desert, precipitation in Gebel Elba Nation Park region tends to be uniformly distributed throughout the year. The flat Eastern desert region of the national park typically gets no more than 50mm of rain a year. On the contrary, mountainous regions of the nation park along the coast of Gebel Elba are affected by orographic precipitation and thus tend to get over 400mm of rain annually. Condensation of moist air from the Red Sea contributes to a 'mist oasis' on the the mountain tops of the nation park . This means that much of the precipitation in the area is a result of dew, mist, and rainfall from clouds. According to the Köppen-Geiger Climate Classification System, Gebel Elba is located in a BWh region. This means that the national park can the characterized as having an arid climate, with desert like precipitation and very hot temperatures. The aridity of this region increases noticeably from the northeast to the southwest. Air surrounding the location warms and descends adiabatically, impeding condensation and resulting in extremely minuscule amounts of precipitation year round. Furthermore, Gebel Elba National Park experiences year round clear skies thus leading to the Sun heating the land surface of our location intensely and keeping the air temperatures relatively high. Although temperatures are higher the high Sun summer months and tend to cool during the low Sun winter months, the national park experiences temperatures over 85 ºF year round. Gebel Elba is affected by northeast trade winds and gets winds that are predominately directed northeastward. These winds reach an average of about 12 mph and tend to be higher in speed during the cooler winter months than the hot summer months. The region in which the national park is located is also affected by warm wind currents that contribute to the region's hot year round temperatures. Much of Gebel Elba's plant and animal population is in danger of extinction. This is largely due to not only intense human hunting over the past century, but also to the continuous heating of the Sahara desert region due to climate change and global warming. The rapid heating of the Sahara desert region is causing many of the plant species to dry out and wither, unable to adapt fast enough to the progressively hotter and dryer environment. The pressure to adapt to the changing climate conditions is also felt by much of the animals in Gebel Elba. Due to climate change the Sahara desert has been expanding, the broadleaf forest may not be able to survive the increase in heat and dryness. Although many are already adapted to the current extreme heat and aridity of the region, they face intense pressure to keep up as the climate gets even hotter and drier. Gebel Elba has also been affected by a few invasive species in the area. The most common invasive species in the national park is the Honey Mesquite (Presopis Glandulosa), a small to medium sized thorny shrub. This plant species originates from South America and Mexico and is considered one of the top invasive species in the world. Its major advantage over other species is its apparent immunity to extermination. Extermination of the Honey Mesquite has proven difficult because its latent buds grow independent of root system deep underground, thus making it hard to completely get rid of the plant species. The Xeric shrubland and desert biome that makes up most of Gebel Elba has relatively little biodiversity due to the fact that it is part of the Sahara desert and has very extreme temperatures with little water. Any mountains in Gebel Elba were formed 550 million years ago. These landforms were formed by hot magma which were pushed through the surface of the Earth. Later, the magma cooled and became the surface of Gebel Elba. Currently, there aren’t any huge erosion processes which affect landforms. Gebel Elba is currently mostly flat, and is indeed a desert. Gebel Elba is on a large exposed patch of igneous and metamorphic rock that formed in the Precambian era. This type of rock is considered stable and unlikely to have any seismic activity, which holds true according to global seismic event databases . Due to the very durable nature of this formation there has been little to no volcanic activity or tectonic for 550 million years ago, which leads to a greater amount of erosion with no renewal which helps perpetuate the desert it is a part of. The mountains in the park were formed from lava that forced its way to the surface 550 million years ago . The sand that is surrounding the mountains come from the Cretaceous sandstone in Northern Africa. The sandstone came from the volcanic mountains that formed in the central part of the Sahara and the granite was weathered to produce quartz sand grains that were carried by rivers and created deposits of sandstone . High winds coupled with coastal waves have also eroded the surface of our location creating a desert environment. Waves of the Red Sea have also curved the coast of Gebel Elba toward the east. Due to divergent plate boundaries in Egypt, the creation of mountain ranges in our location have occurred and contributed to the natural phenomenon of orographic precipitation. Although Gebel Elba National Park does not directly border any plate boundaries, it is fairly close to the divergent fault line that runs through the Red Sea. Due to the national park’s proximity to the fault line, Gebel Elba can potentially have earthquakes of up to 6 on the Richter scale. The last earthquake in the area occurred three years ago and measured 4.3 on the Richter scale. Because earthquakes are not very common in the area, they do little to alter the geology and landforms of Gebel Elba. Even with earthquakes that have occurred in the past, the damage done is too slight to have any major effect on the national park . Gebel Elba National Park currently gets water from an above ground oasis. The water from these oasis allows a xeric shrubland to thrive in the dry and desert like area. Unfortunately, the fresh water from these above ground oasis provide little water quantity for inhabitants and visitors of the park. Furthermore, the closest watershed for the national park is the Nile River. The only instance where glaciers could have impacted our location is the sea level rise due to climate change and the melting of polar ice caps. The coastal region of Gebel Elba along the Red Sea may continue to experience sea level rise in the future as well. There is no historical evidence to think that any of the glacial sheets came down into the latitude of Gebel Elba. Gebel Elba recieves a vast majority of its precipitation as mists that form the Oasis on the upper areas of the mountains. The mountain tops get 400mm of rainfall during the year and the surrounding area gets notably less. 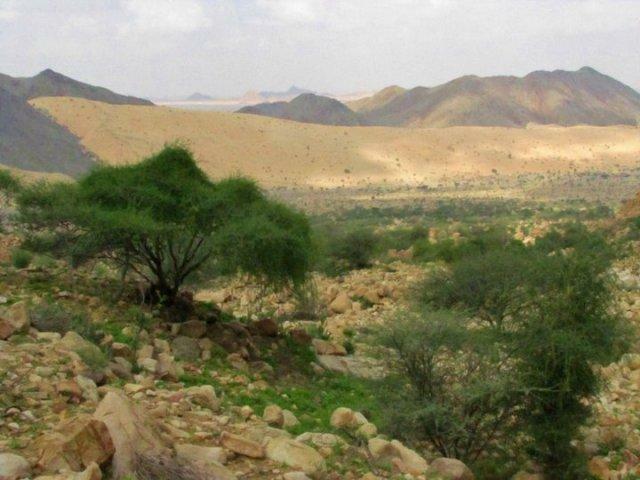 To cope some of the plants have evolved to uptake water from their leaves from the mists that lay over the area.There is no real watershed in Gebel Elba because any water that escapes the oasis is quickly evaporates or soaks into the sands . However parts of the park are inside The Nile watershed, but those area are desert or xeric shrubland which receives very little water. Abd El-Ghani, Monier M., and Kadry N. Abdel-Khalik. "Floristic Diversity and Phytogeography of the Gebel Elba National Park, South-East Egypt." TÜB‹TAK. The Herbarium, Faculty of Science, Cairo University, 11 Nov. 2005. Web. 27 Oct. 2015. "Elba National Park." Elba National Park. Web. 12 Oct. 2015. "The Expanding Sahara: Deforestation in Morocco." DC Bureau. N.p., 13 May 2013. Web. 30 Oct. 2015. "Gebel Elba National Park." Marsaalam. N.p., 2013. Web. 12 Oct. 2015. "Read This Story." How Animals Adapt to Desert Life. N.p., n.d. Web. 29 Oct. 2015. "Sites - Important Bird and Biodiversity Areas (IBAs)." Birdlife Data Zone. Web. 28 Oct. 2015. "The Elba Protected Area." The Elba Protected Area. Web. 28 Oct. 2015. "WWF WildFINDER." WorldWildlife.org. World Wildlife Fund. Web. 29 Oct. 2015. "Ornithological Society of the Middle East” Web. 10 April. 2010. Kearey, Philip (2001). The New Penguin Dictionary of Geology. p. 243. “Sahara” Web. 4 Dec. 2015. <http://www.1911encyclopedia.org/Sahara>. "Jabal Elba (mountain)." Chinci: World Atlas. Web. 3 Dec. 2015. <http://www.chinci.com/travel/pax/q/375916/Jabal Elba/SD/Sudan/0/>.